IT'S time to recharge and reconnect with a summertime caravan and camping holiday. That's the advice from NSW's Caravan & Camping Industry Association chief executive Lyndel Gray. "It's amazing the kind of rejuvenation a caravan or camping holiday can deliver," she said. The beginning of summer marks the start of Australia’s love affair with caravan and camping - the perfect opportunity to unwind, disconnect from work, reconnect with family and generally enjoy life to the full. January is the most popular month for caravan and camping holidays in NSW, and it is no surprise given that 94 percent of campers believe the experience recharges their batteries, connects them to nature and generates happy memories. "Campers are more satisfied, happy, optimistic and energised than non-campers," Ms Gray said. "Parents feel camping brings their families closer together, teaches kids to be more social, helps them learn about the environment and gives them life skills." Her association has just released its latest Caravan & Camping Parks & Products Guide, the most extensive source of information on everything you need to know when holidaying in NSW. 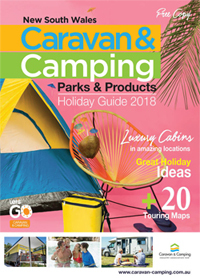 It includes information on downloading a free copy of the Caravan & Camping Guide 2018 which offers information on over 400 parks and 200 caravan, camping and RV dealers, manufacturers and service and repair providers throughout the state. There are more than 20 touring maps covering all of NSW. "Across NSW, people spend more than 17 million nights in caravan and camping accommodation each year, making it one of the most popular types of holiday in the state," Ms Gray explained. "NSW has an amazing array of getaway options - from the beach to rivers, mountains, wine regions, and the outback - all of which have great holiday parks to enjoy."